In 1961 President Kennedy issued a challenge to land a person on the moon and return safely to Earth before the end of the 1960s, a bold proclamation at the time, given that only one US astronaut had been to space, for just 15 minutes. The race to the moon was part of the larger Cold War between the United States and the Soviet Union, a race where the Russians appeared far ahead of the Americans. Apollo was a complicated, dangerous and expensive adventure involving 400,000 people across the nation. Before it was over, NASA had made 11 Apollo flights, six of which landed on the moon, and eight astronauts had lost their lives. But it was also fun, and the crews never missed a chance to enjoy the trip or pull off a prank 240,000 miles from home. 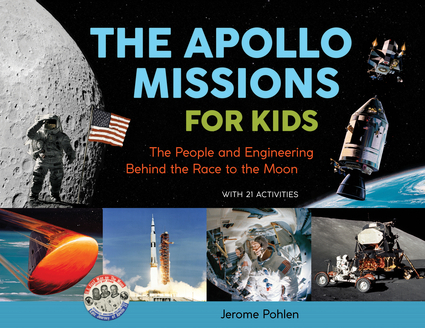 The Apollo Missions for Kids tells the story from the perspective of those who lived it—the astronauts and their families, the controllers and engineers, the technicians and politicians who made the impossible possible. Jerome Pohlen is a former elementary school science teacher, an engineer, an editor, and the author of Albert Einstein and Relativity for Kids as well as a dozen award-winning science kits, including Famous Experiments, Microscopic World and Wild Weather.